OERs have been around for well over fourteen years. The intent is that individuals and organizations can curate, download, and upload education resources to repositories. This content is “open” and free of charge. Materials in these repositories come from generous individuals that are willing to share content and strategies that have worked for them in their own classrooms (see OERs provided by Joint Digital). Other content may be the result of research projects funded by government grants and even private sources. These materials have to be shared and done so without cost to the end-user according to the terms of the funding source. So, why is it that publishers are putting content together and packaging it for a specific course and then charging the school/institution, or each individual student for the right to access these materials? I am a former director of a department at a two-year college, that supported faculty through the development of course content and mediated course materials. I fully understand the investment in time and the overall value of the materials that are developed. Content can be valued in the thousands of dollars. With this in mind, I don’t begrudge publishers charging a fee to recoup their investments and even turn a profit. That’s how capitalism works. My issue is the label that many are assigning to their new products. Online learning is really taking off. As a result, so is the use of OERs. Open Education Resources are trending in a big way as more and more faculty are abandoning older methodologies and materials that were used in the face-to-face classroom in an effort to remain effective in the online environment. Publishers also see the writing on the wall. Wikibooks, OERCommons, both OER by the way, and used book sales on various Internet market places are making it possible for students and faculty to avoid spending money with a textbook publishing company all-together. Most colleges have abandoned private ownership of bookstores. Textbooks just don’t present the opportunity for profit that they once did. I understand the push by publishers to remain relevant and as such, profitable. However, they are attempting to do so in a rather deceptive way–selling Open Education Resources. Are Open Education Resources Really Open? A pubisher, or any other entity, implying that they are selling an OER is engaging in a deceptive practice at worst, or applying a misnomer at the very least. 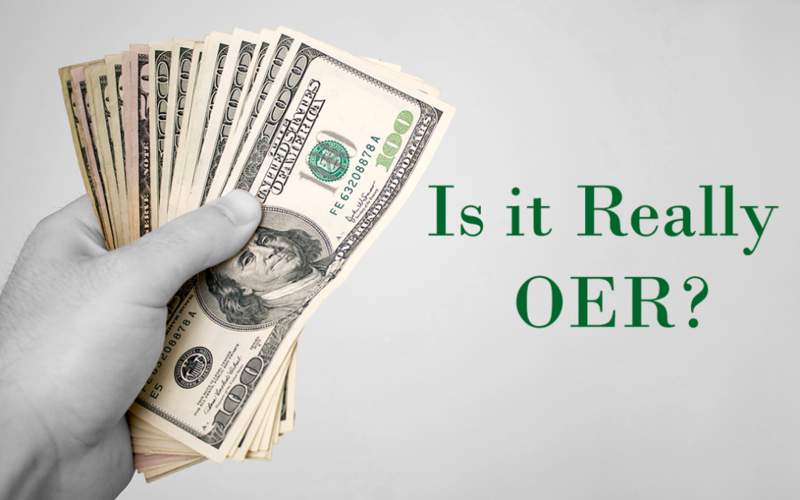 If they are going to sell OERs, they need to drop the “O” and should refer to them simply as Education Resources. In years gone by, publishers sold this same kind of content and called it “course content”, or “course cartridges”. This content was packaged in a way that made it very easy to import into various learning management systems. Typically the fees for access to these were included in the cost of the textbook. Publishers are basically offering these same products, they have just erroneously changed the name in an effort to capitalize on the trendy term OER. I challenge instructors, support staff, school administrators, and even students to pay careful attention to this deception. “Look before you leap” definitely comes to mind. Educators and the institutions they work for, need to remember that they have an obligation to be an advocate for the learner. Your advocacy doesn’t end in the classroom. Remaining vigilant to these misnomers is incumbent upon you. Neither instructors or students should pay for something that by its definition is free. Help keep education financially accessible to all. Check repositories and communities online for true OERs to see if you can benefit from the free resources. Challenge your publisher reps and companies to change how they market their products in a clearer more appropriate category. It is up to you to determine if it really is OER!